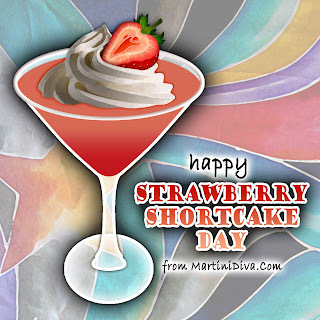 It's NATIONAL STRAWBERRY SHORTCAKE DAY - Martinize this dessert! 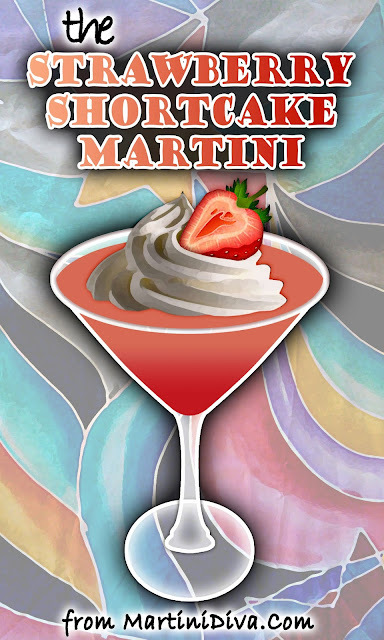 Put down your fork and grab a martini glass and enjoy your strawberry shortcake in true martini style with my recipe for The Strawberry Shortcake Martini. Strawberry shortcake* dates back as least as far as the 1850s but shortcake itself is a European treat that goes back to the 1500s. Shortcake got it's name from the shortening used to make dough tender. Shortening is a term that means "to shorten" a 15th century term which meant, "easily crumbled" so a traditional shortcake was originally a crumbly biscuit. Shakespeare even mentioned shortcake in his play, The Merry Wives of Windsor. Puree enough fresh strawberries for 1/2 cup of strawberry puree. Refrigerate. Crush up about 1/2 cup of shortbread cookies, then pour into a small plate. then into the crushed cookies, then chill glass in the freezer. Put 1 cup of ice into your cocktail shaker then add both vodkas and the cold strawberry puree and shake until chilled. 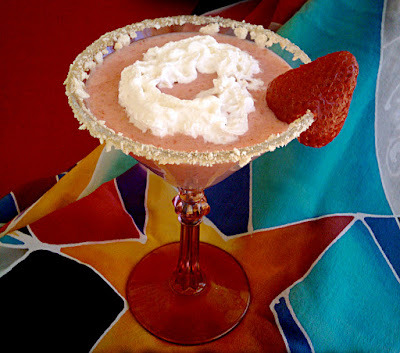 Pour into your martini glass, top with whipped cream, add a fresh strawberry, serve. Heat oven to 425°F. In a medium bowl mix together the Bisquick, milk, sugar and butter until a dough forms. On an ungreased cookie sheet drop the dough with a spoon into six separate rounds and bake 10 to 12 minutes or until golden brown. You can split the shortcakes and fill and top with sugared strawberries then top with whipped cream, or pour on half & half.